We welcome all new account customers. Please fill in this form and we will be in touch when we have processed your application. By submitting this form I/We hereby authorise you to open a Credit Account with your company. I/We also confirm that I/We have read and fully understand your terms and conditions of Trade and Carriage. I/We agree and accept that these will form the basis of trading. I/We also confirm that I/we am/are "duly authorised" to submit my/our application form on behalf of my/our organisation. We always treat your personal details with the utmost care and will never sell them to other companies for marketing purposes. Yes, I would like to receive news, offers and the latest updates from the website by Email. 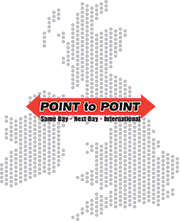 Established in 1983, Point to Point Couriers have all the experience necessary to deliver an exceptional courier service in London and Nationwide. In an ever changing world and market, personal attention and efficiency are embedded in our business culture.